Stuart Middleton has a background in English teaching specialising in the teaching of English in linguistically diverse communities. He taught at several Manukau secondary schools before joining the Auckland College of Education where he taught secondary teacher education courses in English and Education. He has worked as a consultant in a variety of countries throughout the Pacific and has contributed to policy development in Great Britain. After a period as Principal of Aorere College he returned to the Auckland College of Education as General Manager Academic Services prior to taking up his current position. He wrote regular columns for New Zealand Education Review in New Zealand Campus Review in Australia. He speaks and writes on a wide range of educational topics. In 2002 he completed a PhD thesis on the dynamics of transformational change in a tertiary education institution. He continues to write a weekly column for Campus Review in Australia and maintains a regular online blog – EDTalkNZ. His awards have included QANTAS Media Awards in 2002 and 2003 as the Best Social Issues Columnist in new Zealand, a Commonwealth Relations Trust Fellowship to the University of London Institute of Education and in 2007 – 2008 he was awarded a Fulbright New Century Scholars Award and it was out of that work that New Zealand’s first Tertiary High School was developed and opened at Manukau Institute of Technology was developed. In 2010 he was made an Officer of the new Zealand Order of Merit (ONZM) for his services to education. IN 2012 he was appointed as a Justice of the Peace. He is involved widely in community organisations In Manukau which has included several periods as Chair of the City of Manukau Education trust. He is involved widely in community organisations in Manukau which has included several periods as Chair of the City of Manukau Education Trust. 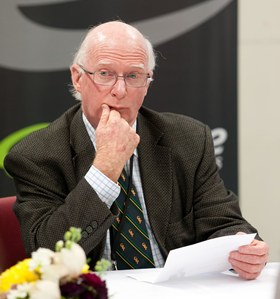 He is currently a member of the Auckland Council Business Advisory Panel, executive member of the Auckland Tertiary Education Cluster and Trustee of the Genesis Trust. I heartily agree with your sentiments regarding ECE. The fee hours have not worked for the majority of families in low soci-economic areas. i ahve put drops out explaining free service but no one from the community have picke dthis up. Yes ECE has become a big money making business and this was not the dream of David Lange. The Green’s are still in the limelight about crying “Poverty”!!! This is a blast from your considerable past. Now that I have seen your profile, I can confirm what I have known since first following your outstanding career – that we were indeed at Fairfield College together in the sixties. I was a swimmer and I think we were in a tennis team together? Anyway, just wanted to say hello and that I have admired all your achievements from afar. I went into teaching myself – English and History as it happens and have retired to Wellington where I still keep my hand in by helping new immigrants with their language skills. I remember you well from our days at Fairfield and especially your swimming ability. I think that you were much better at tennis than we weren Actually it is tennis that reminds me of a mement in history WE were headed out to HBHS for a match and were to meet on the Railway Bridge in Hamilton. I still see clearly the moment you arrived and the first words you said were: “Someone has shot Kennedy!” Funny the those where were you moments. Ewen 9my twin) passed away nearly two years ago – trough his adult life he never enjoyed good health. I come to WEllington quite fequently – it might be nioce to have a cup of coffee together.